Forbidden Planet has a large range of merchandise from film and TV to games and graphic novels. Although featuring a range of products, Forbidden Planet is best for figurines and toys; the site has a huge range of really cute POP! Vinyl figures. If you are looking for something a little less adorable, Forbidden Planet also offers such treasures as replica Chucky dolls and Freddy Krueger’s glove. There is also a section for clothing and apparel. 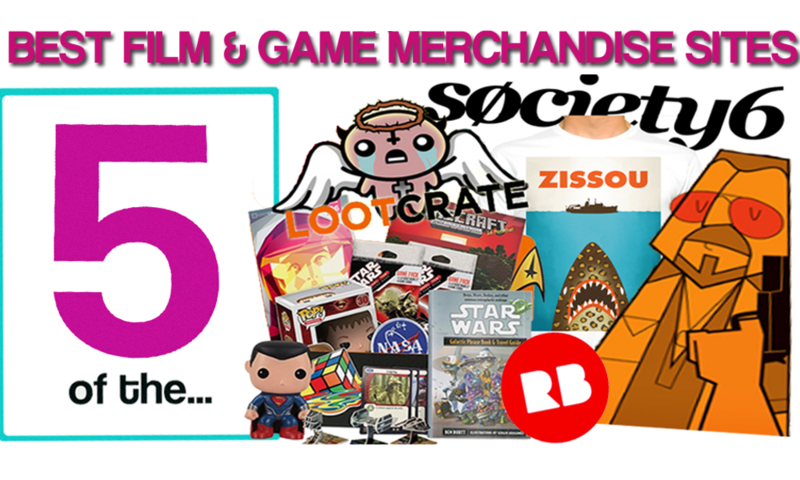 In terms of both video game and film merchandise, the site focuses mainly on big names, and in some sections there are very few products (clicking on certain sections actually brings back no items). For figures ans statues, Forbidden Planet is a good site to check out, but for clothing and other merchandise, the site has less to offer. 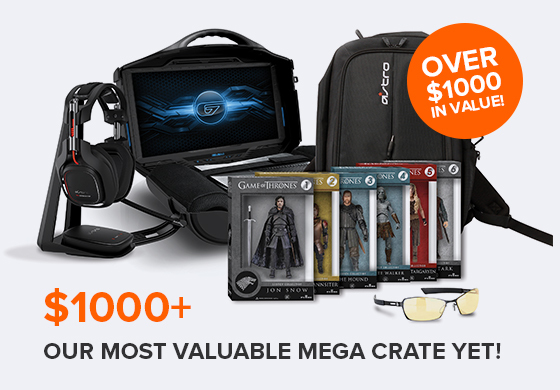 Loot Crate is a unique subscription service which sends you a crate full of gaming goodies once a month. Each month, the crate has a different, vague theme – past themes have been ‘survive’, ‘animate’ and ‘launch’- this month’s theme being ‘dragons’. Whilst the theme of the crate is announced, the contents remain a secret meaning that the merchandise you receive each time is a surprise. Well, you are able to peek as there are plenty of ‘unboxing’ videos of Loot Crates on YouTube. The crates differ vastly and you will receive merchandise that cannot be found anywhere else. The crates usually include a number of different items such as figurines, books, and stickers, whilst most crates also contain a t-shirt. 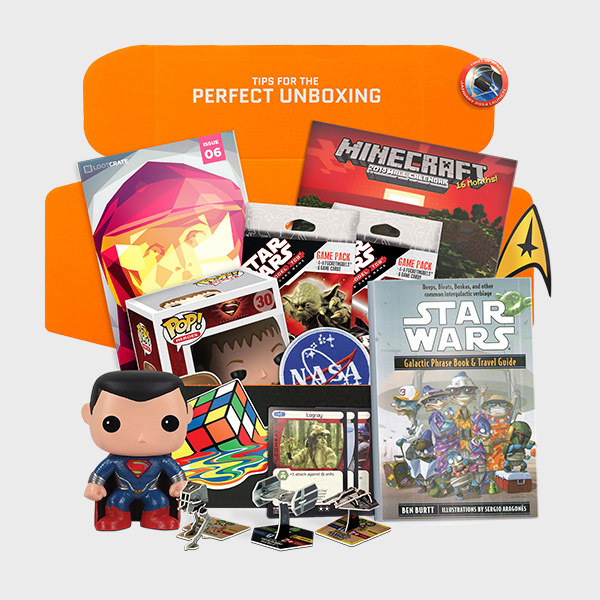 You may think it is hard to justify paying for a box when you have no idea what it contains, however, the Loot Crate website shows you their past crates, and this is a good indication of what you can expect to get. Everyone who buys a crate is entered into a draw to win the monthly Mega Crate which is worth hundreds of pounds. 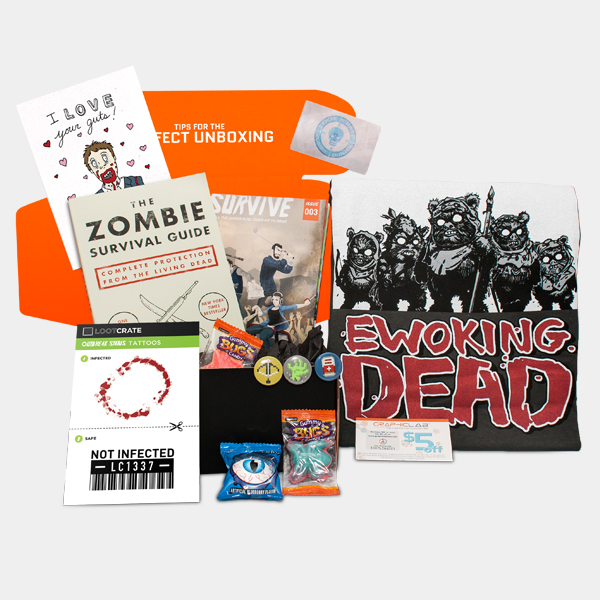 Loot Crate offer 1 month (around £18), 3 month (around £17/mo) and 6 month (£16/mo) plans. Each crate contains over $40 worth of merchandise. J!NX is a site which specialises in ‘clothing inspired by video games and geek culture’. In addition to being the official Minecraft store, J!NX offers plenty of other merchandise from Portal pants to Half-Life headcrabs. The site sells t-shirts predominantly, however other items are available. Many tees are available from £7.99 ($9.99) plus shipping, making it one of the better priced sites. Although offering a range of products, J!NX tends to feature merchandise from bigger name games – particularly esports merchandise from the likes of League of Legends, Starcraft, Dota and Twitch – and therefore J!NX lacks the breadth and the diversity of similar websites. If interested in one of the few games that the site does have merchandise for, there is a fair amount of choice; however, for a wider selection, or for more obscure or independent games, better sites can be found. 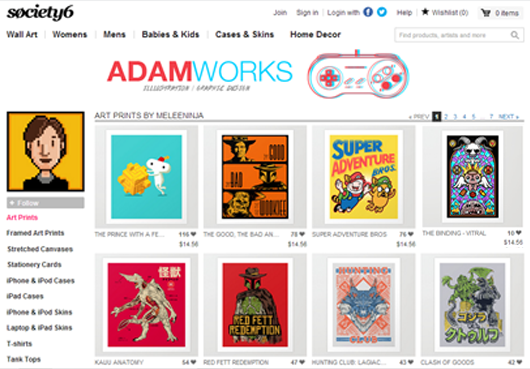 On Redbubble you can find lots of cool art from independent designers. Whether you want to cater for your niche movie needs from Taffin t-shirts to Troll 2 stickers, or satisfy your retro gaming desires with cool Banjo Kazooie tees, Redbubble has plenty of merchandise on offer. Redbubble promotes independent artists; many unique and interesting designs can be found on the site, and there is also an option to sell your own artwork. Although various formats are available, Redbubble’s main attraction is clothing. Most designs can be purchased as standard tees, tank tops, hoodies, baseball shirts and fitted t-shirts – Redbubble has more options for female clothing than similar websites. All items of clothing are available in around twenty different colours, and standard tees are usually priced at £15-20 (around $25-33) plus shipping. Society6 should always be your first port of call if you are looking for anything cool to wear, to drink from, or even to furnish a room. Whether you want your own Big Lebowski rug, a Psycho shower curtain or a Groundhog Day wall clock, Society6 can meet your requirements and really tie the room together. With so much art on offer, a search of your favourite film, game or TV show will usually return many wonderful and creative results available in different formats and sizes. Society6 doesn’t just cater for entertainment buffs, as it also acts as a platform for many artists to be able to sell their cool, creative work. 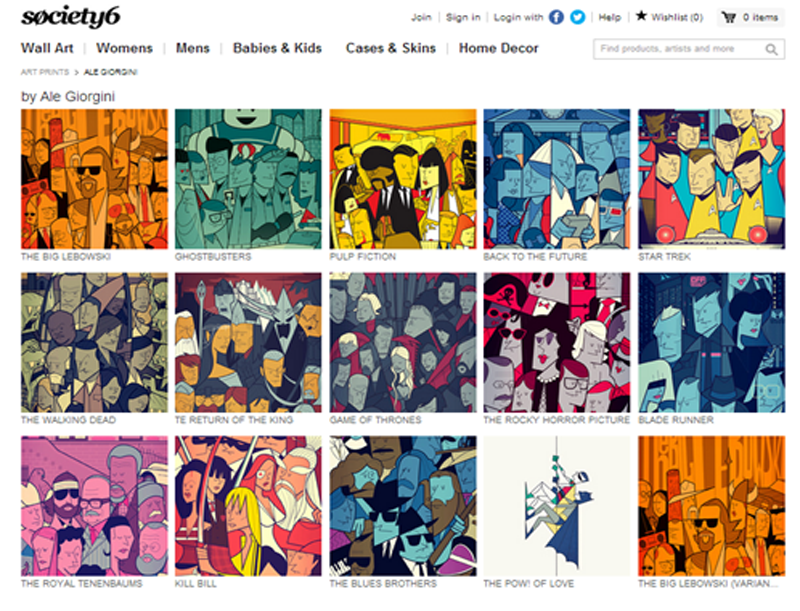 The site allows you to view an artist’s profile if you enjoy their work and are looking for similar prints. Posters start from around £8 (around $14) and tees from £13 (around $22) plus shipping.